Joel Edgerton is one of many Star Wars alumni who is excited by the possibility of returning to Star Wars in the Disney era. 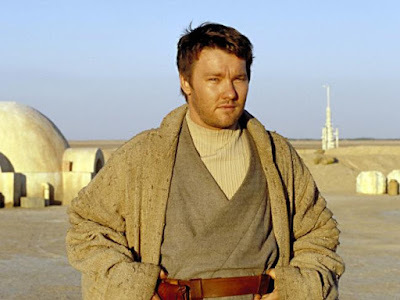 Edgerton played a young Owen Lars, Luke's future grizzled uncle, in Attack of the Clones and Revenge of the Sith, and he has some ideas of his own for what an Uncle Owen A Star Wars Story film might look like. Edgerton was promoting his new film It Comes At Night and he spoke with Business Insider about his ideas for his Star Wars character. Edgerton said, "I like the idea that Uncle Owen is one of those guys who has done some super cool s--- but has just never bragged about it." How would this play out in a movie? Edgerton has some ideas for that too. He said, My idea is that he could go out and have some adventure and then he comes back and slips back into that unassuming moisture farmer role. Everyone talks about Obi-Wan being super cool, Owen secretly knows that he was there, and he did some of the cool s---, too." Edgerton had previously said he's game to return to Star Wars. When asked in 2014 about the possibility of returning as Owen in the long rumored Obi-Wan Kenobi stand alone film, Edgerton said, "Well then I definitely have to be there, right? Or they're gonna get someone else? Am I too old for that now?"